Introduction: Fluorine is the 13th most abundant element in the earth crust and is available in various environmental, clinical, and food samples in varied concentrations. Aim: To estimate concentration of fluoride in five medicinal and five nonmedicinal edible leaves locally grown around Raipur, Chhattisgarh, India. Materials and Methods: Samples of ten medicinal and nonmedicinal edible leaves, namely, spinach (Spinacia oleracea), coriander leaves (Coriandrum sativum), chawli bhaji (Amaranthus spinach), lal bhaji (Alternanthera bettzickiana), mooli bhaji (Raphanus sativus), neem (Azadirachta indica), tulsi (Ocimum tenuiflorum), mint leaves (Mentha longifolia), betel leaves (Piper betle), and bael leaves (Aegle marmelos) were collected in the clean polyethene bags. After thorough washing with water, leaves were left to dry in ambient temperature and crushed into powder using a mixer grinder. One gram of each of the powdered samples was taken and analyzed for fluoride concentration using a 2-(4-sulfophenylazo) 1,8-dihydroxy-3,6-naphthalenedisulfonic acid trisodium salt spectrophotometric method. Results: The presence of fluoride in varied concentrations in locally grown edible leaves were analyzed. The highest concentration of fluoride was reported in tulsi (6.0 μg/g) and lowest in mint leaves (1.1 μg/g). Two edible leaves, neem and bael, showed fluoride concentration below detection limit. Conclusion: Knowledge regarding the importance of edible leaves may be lost in the near future unless efforts are made to educate younger generations about their importance. Hence, the time has come to make good use of centuries-old knowledge through modern approaches for their better economic and therapeutic utilization. Fluoride is widely distributed in nature; it is estimated to be thirteenth in abundance among the elements of the earth. Its strong affinity for calcium and other metals with which it forms complex compounds accounts for its pharmacological significance. It is present in bones and teeth and in nearly every human tissue under certain conditions. Fluoride enters human body from a variety of sources, including many foods and beverages. Most foods, either derived from plant or animal life, contain fluoride at least in minute amounts and its levels vary widely, even between samples of the same kind of food. When fluoride is absorbed by the plant through soil, it is deposited mainly in the roots and stems, whereas in leaves, it is deposited through the fluoride ion present in air. There are many inconsistencies in the fluoride ion content of food derived from plants which can be attributed to the locality in which they are grown, type of soil, distance from an air-contaminating source, direction and intensity of prevailing winds, season, especially whether dry or wet, weather conditions at the time of sampling, edible portion of the plant, and whether the plant was fertilized or sprayed. Since ancient times, conventional methods and techniques have been practiced in the state. Leaves of edible plants have been used in virtually all cultures as a source of medicine. They have been used in the treatment of various human diseases for thousands of years all over the world and are still the mainstay of health care in Chhattisgarh state. These edible leaves are of great medical and dental importance due to its health benefits. Neem has been extensively used in Ayurveda, Unani, and Homeopathic medicine and has become a cynosure of modern medicine. The medicinal properties of neem include immunomodulatory, anti-inflammatory, antihyperglycemic, antiulcer, antimalarial, antifungal, antibacterial, antiviral, antioxidant, antimutagenic, and anticarcinogenic. Tulsi can be a promising herb in the treatment of many oral disorders due to its anti-inflammatory, antibacterial, antioxidant, and immunomodulatory properties. Mint, also known as Mentha, is also used in toothpaste and mouthwash. Bael tree is native to India, and it has got immense medicinal values. It stimulates production of bile, improves digestion, and controls the blood sugar levels. The health and nutrition of expanding world populations are major upcoming challenges, especially in developing countries. To the best of our knowledge, there is no such research undertaken in Raipur, Chhattisgarh, to estimate the concentration of fluoride in locally grown edible leaves. In view of this, the present study was undertaken with an objective of estimating concentration of fluoride in medicinal and nonmedicinal edible leaves locally grown around Raipur, Chhattisgarh, India. The cross-sectional study was conducted to estimate the concentration of fluoride in edible leaves locally grown around Raipur, Chhattisgarh, India. Samples of ten different edible leaves were collected in sufficient quantity in July 2015. The collected samples were stored in the clean polyethene bags. After thorough washing with water, leaves were left to dry in ambient temperature. The dried leaves were crushed into powder using a mixer grinder. The powdered samples were transported to the laboratory (Department of Chemistry, Bhilai Institute of Technology, Raipur, Chhattisgarh, India) for analysis of fluoride concentration. Nonmedicinal edible leaves, namely, spinach (S. oleracea), coriander leaves (C. sativum), lal bhaji (Alternanthera bettzickiana), chawli bhaji (Amaranthus spinach), and mooli bhaji (Raphanus sativus). All reagents used in the estimation of fluoride concentration were prepared freshly by an experienced technician under the supervision of expert analyst. Distilled water was used for all dilutions. All glassware was soaked in nitric acid for 24 h and rinsed with distilled water before use. Absorbance measurements were performed on a spectrophotometer (Model No. 304, M. S. Electronics Private Limited, India). Sodium arsenite solution: Dissolve 5.0 g sodium arsenite (NaAsO2) in distilled water and dilute to 1000 ml. The SPADNS spectrophotometric method was used to determine the concentration of fluoride in edible leaves. This method is a type of colorimetric method, in which the reaction is immediate, color is stable, and no waiting period is necessary. It is based on the principle that when fluoride ion changes the color that color change is proportional to the fluoride ion concentration. Take fluoride standard solution in 50 ml Nessler tubes and make up to the mark with distilled water. Add exactly 10.0 ml acid-Zirconyl-SPADNS reagent to each tube and mix well. Set the spectrophotometer to zero absorbance using reference solution after that measure the absorbance of the standards immediately at 570 mμ. Then, plot a calibration curve to determine the concentration of sample solutions. The results of this study revealed the presence of fluoride in varied concentration in locally grown medicinal and nonmedicinal edible leaves. 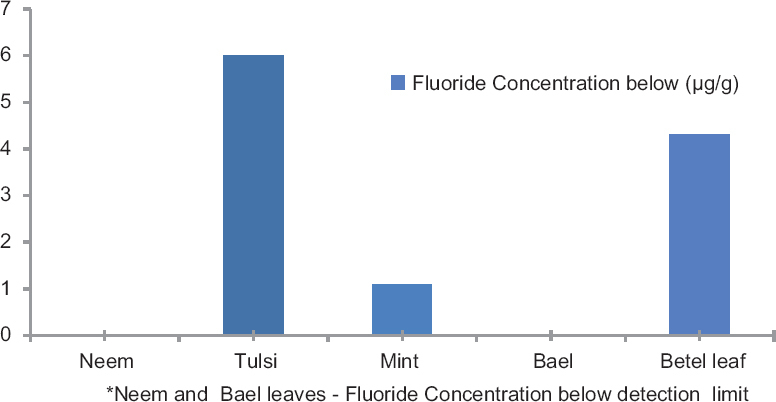 [Figure 1] depicts the concentration of fluoride in medicinal leaves, the highest concentration of 6.0 μg/g fluoride being reported in tulsi (Ocimum sanctum) followed by betel leaf (P. betle) and mint leaves (M. longifolia), i.e., 4.3 μg/g and 1.1 μg/g, respectively. Two medicinal leaves neem and bael showed concentration of fluoride below detection limit. [Figure 2] depicts the estimated concentration of fluoride in nonmedicinal edible leaves which ranges from 1.5 μg/g to 4.5 μg/g. The highest concentration of 4.5 μg/g was reported in mooli bhaji (R. sativus) followed by 4.4 μg/g in spinach (S. oleracea), 3.1 μg/g in lal bhaji (A. bettzickiana), 1.6 μg/g in coriander leaves (C. sativum) and lowest concentration of 1.5 μg/g in chawli bhaji (A. spinach). Fluoride is available in various environmental, clinical, and food samples in varied concentrations. Earlier, it was believed that water is the only source of fluoride, but now, it is well documented that there are many other sources from which it can reach to the body. It has been reported that 70% intake of fluoride is through drinking water while 30% is through food. Even though ingestion of toxic amounts of fluoride is a rare scenario, still due to the variation and complexity of fluoride ingestion from possible sources, it is necessary to compute the contribution of dietary fluoride to daily total fluoride intake, irrespective of residing in communities with fluoridated or nonfluoridated water. It is very well documented that as a chemotherapeutic agent to combat dental caries, fluoride occupies a matchless position. In this sense, it is important to verify the enormous use of edible plants that are safe, effective, and economical so that it can be used as an alternative preventive and treatment option for oral diseases. Use of edible leaves has attracted worldwide prominence in recent years, owing to its wide range of medicinal properties. These leaves have various therapeutically and industrially useful preparations which generated encouragement among the scientists in exploring more information about them. The available literature on the presence of fluoride in tea leaves suggests that there might be the presence of fluoride in traces in other edible leaves. Hence, to attain the benefits from these leaves, it is imperative to take an in-depth look into the various available sources of fluoride including edible leaves. In the present study, mint leaves (M. longifolia) showed fluoride concentration of 1.1 μg/g, which is comparatively lower with the findings of Sengupta and Pal. In their study, mint leaves showed 4.8 μg/g of fluoride because the water used for irrigation had fluoride concentration of 0.4 mg/L. The present study reported 4.4 μg/g fluoride concentration in spinach leaves (S. oleracea), whereas in other studies, spinach leaves tend to accumulate 29.15 ppm and 25.7 ppm fluoride which is much more higher in comparison with the present study because the irrigation water had 3.54–11.82 mg/L fluoride  and 1.57–13.83 mg/L fluoride, respectively. Fluoride concentration of 1.5 μg/g in chawli bhaji (A. spinach) was found in our study. The data from different studies showed fluoride level of 4.91–7.14 μg/g  and 22.7 μg/g  where irrigation water had fluoride levels of 0.4 mg/L, 0.15–0.48 mg/L, and 1.57–13.83 mg/L fluoride, respectively. The results of all these studies prove the fact that higher the concentrations of fluoride in water, higher the concentration in food. In our study, the two medicinal leaves neem and bael show concentration of fluoride below detection limit; the reason might be the less uptake of fluoride by the plant from soil and water as these trees are comparatively taller than the other trees which we had taken in our study. The concentration of fluoride varies from place to place, but in the present study, we were unable to collect the leaves from different sources. The concentration of fluoride also depends on the nature of soil and quality of water used for irrigation, but we had not taken into account the concentration of fluoride in water and soil from where the samples were taken and also we had not estimated the concentration of fluoride that will be available after cooking. To our knowledge, this is the first study to report fluoride concentration in locally grown edible leaves in Chhattisgarh state. Hence, further studies are recommended with exact estimation of fluoride in water and soil of the study area which will help the researcher in the near future explore new vistas regarding edible leaves for its beneficiary health effect. These edible leaves are readily available and are culturally, religiously, and socially accepted sources of nutrition. Hence, we can say that the use of these edible leaves are relatively economical and can be administered to large fractions of populations who are at risk of caries. This can be introduced as new ways for fluoride supplementation in the areas where fluoride concentration in water is below optimal level and where no other supplements are available. Edible leaves can act as an additional source of fluoride ranging from 1.1 to 6.0 μg/g in medicinal leaves and 1.5 to 4.5 μg/g in nonmedicinal leaves. The medicinal property of edible leaves should not only restrict to treat disease but also restrict to improve the overall health due to its nutritive properties. The use of edible leaves can contribute useful amounts of essential nutrients to human diets, and also, it can act as an additional source of fluoride which might be a valuable strategy and new approach to eliminate dental caries as a public health problem. Kirk RE, Othner DF. Encyclopedia of Chemical Technic. 6th ed. New York: Interscience Publishers Inc.; 1951. Daines RH, Leone I, Brennan E. The effect of fluoride on plants as determined by soil, nutrition and fumigation studies. New York: McGraw-Hill Book Co.; 1952. Gautam R, Bhardwaj N, Saini Y. Fluoride accumulation by vegetables and crops grown in Nawa tehsil of Nagaur district, Rajasthan, India. J Phytol 2010;2:80-5. Waldbott GL. Fluoride in food. Am J Clin Nutr 1963;12:455-62. Horticulture and Farm Forestry. National Informatics Centre, Chhattisgarh. Available from: http://www.cghorticulture.gov.in/. [Last accessed on 2015 May 23]. Performance of Agriculture in Chhattisgarh. Available from: http://www.agridept.cg.gov.in/. [Last accessed on 2015 May 23]. Chauhan D, Shrivastava AK, Patra S. Diversity of leafy vegetables used by tribal peoples of Chhattisgarh, India. Int J Curr Microbiol Appl Sci 2014;3:611-22. Hoareau L, Da Silva EG. Medicinal plants: A re-emerging health aid. Electron J Biotechnol 1999;2:56-70. Chaurasia A. Tulsi-A promising herb in dentistry. J Oral Med Oral Surg Oral Pathol Oral Radiol 2015;1:21-3. The Health Benefits of Popular Foods. Available from: http://www.medicalnewstoday.com/articles/269143.php?page=2. [Last accessed on 2015 May 29]. Health Implications of Bael. Available from: http://www.medindia.net. [Last accessed on 2015 Jun 01]. Betel Leaves – An Ayurvedic Medicinal Herb. Available from: http://www.nzhealth.net.nz/herbs/betel.shtml. [Last accessed on 2015 Jun 05]. Medicinal Uses of Spinach. Available from: http://medicinecareinfo.blogspot.in/2011/07/medicinal-uses-of spinach.html. [Last accessed on 2015 Jun 06]. Coriander – The Wonder Herb. Available from: http://www.medindia.net/patients/lifestyleandwellness/coriander-the-wonder-herb. [Last accessed 2015 Jun 09]. Health Benefits of Coriander. Available from: http://www.timesofindia.indiatimes.com/life-style/health-fitness/health-news/Coriander-has-multiple-health-benefits/articles. [Last accessed on 2015 Jun 09]. Kumar AC, Divya Sree MS, Joshna A, Lakshmi MS, Kumar DS. A review on South Indian edible leafy vegetables. J Glob Trends Pharm Sci 2013;4:1248-56. Okibe FG, Ekanem EJ, Paul ED, Shallangwa GA, Ekwumemgbo PA, Sallau MS, et al. Fluoride content of soil and vegetables from irrigation farms on the bank of river Galma, Zaria, Nigeria. Aust J Basic Appl Sci 2010;4:779-84. Manivaskam N. General physical and chemical measurements. In: Maniwaskam N, Prakashan P, editors. Physico-chemical Examination of Water Sewage and Industrial Effluents. Meerut, India: Pragati Prakashan; 2005. p. 93-4. Bhargava D, Bhardwaj N. Study of fluoride contribution through water and food to human population in fluorosis endemic villages of North-Eastern Rajasthan. Afr J Basic Appl Sci 2009;1:55-8. Sengupta SR, Pal B. Iodine and fluoride contents of food stuffs. Indian J Nutr Dieter 1937;8:66-71. Lakdawala DR, Punekar BD. Fluoride contents of water and community consumed foods in Bombay and a study of dietary intake. Indian J Med Res 1973;16:1679-87.